A fun and delicious low carb alternative to taco pasta. Use a fork to scrape squash until it separates into strands. Set aside. Add garlic, onions and ground turkey to a large skillet. Cook until ground turkey has browned, crumbling the ground turkey as you cook it. Drain out excess fat. Sprinkle taco seasoning across turkey. Add black beans, can of tomatoes (including the liquid), 1/4 cup water and stir into the turkey mixture. Stir and cook on medium heat until everything is evenly mixed, turkey is cooked through, and sauce has thickened. Preheat oven to 400F. 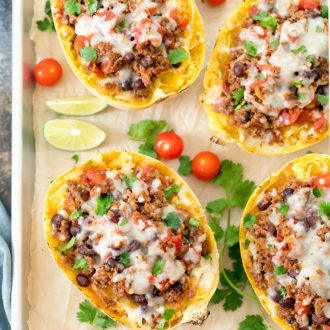 Place spaghetti squash halves onto baking sheet. Top each half with taco meat and sauce. Sprinkle with cheese. Place squash into oven and bake for 5-8 minutes or until cheese is melted. Garnish with cilantro. Serve with lime wedges to be squeezed over sauce. For oven or microwave spaghetti squash cooking instructions, see this post. For Instant Pot cooking instructions, see this post.